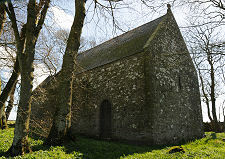 Cruggleton Church stands in a field on the east or seaward side of the B7063 at a spot 2½ miles as the crow flies from Whithorn. It stands within a square, round cornered and tree-filled enclosure in the middle of a field a short distance from the road. It is possible to park beside the road near a gate that gives access to the cultivated and pathless field, and a signpost directs you to walk across whatever is growing in it. At the far side access to the stone-walled enclosure surrounding the church is via an iron gate, or by means of a ladder stile over the wall. The church itself is a simple stone oblong aligned east to west. 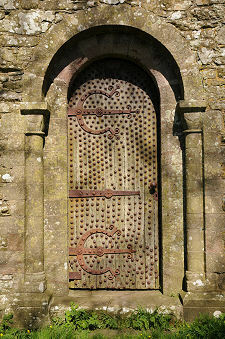 There are spectacularly decorated doors on the north and south walls of the nave, and a further exceptionally narrow door on the south side of the chancel. All were locked when we visited, but the interior is reported to be home to a fine Romanesque chancel arch. To judge from the few tiny windows which pierce the walls it must also be extremely dark. 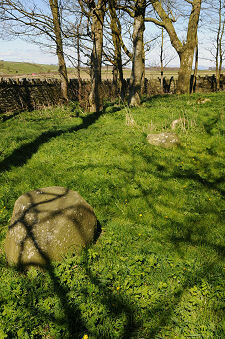 Cruggleton Church is fairly closely surrounded by undergrowth and trees, and what was once presumably the churchyard is today home to just two significant features. The first is a stone outlined enclosure which extends from the south wall of the chancel. 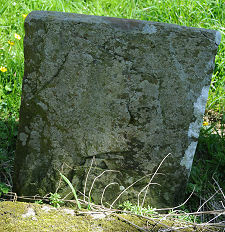 This is unusual in appearance, and is home to just one gravestone, whose inscription, if one ever existed, is no longer visible. Meanwhile, beyond the west end of the church, between the wall and the access gate, is a line of boulders which must have been deliberately placed in their locations, but whose purpose is impossible even to guess at. The origins of the church seem to date back to the 1100s, and it was probably built by whoever was also responsible for building Cruggleton Castle, whose scant remains stand on the coast a little under half a mile to the east. This is believed to have belonged to the Lords of Galloway and later to the Earls of Buchan. In the 1600s the parish of Cruggleton was joined with that of Sorbie and the church seems to have gone into decline. 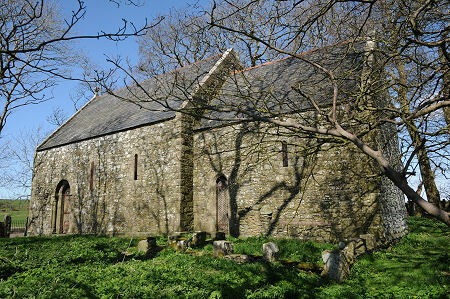 In 1890 Cruggleton Church, by now in very ruinous condition, was rebuilt in the form you see today. Some may scoff at the idea, but it is very easy to pick up feelings about buildings. 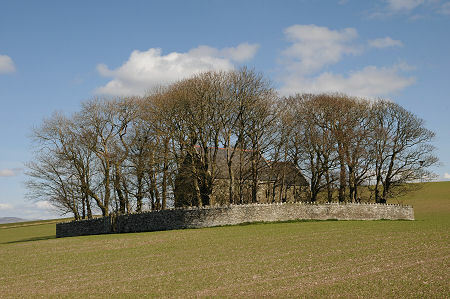 Even seen from the road (and even in early Spring when the building can still be seen through the trees) Cruggleton Church appears forbidding. The unwelcoming sense it gives off only grows stronger as you enter the enclosure itself, to the point where it was almost a relief when we found that the doors were locked and the interior inaccessible. Although it may not look it from the images on this page, we visited on a day when a cold wind was blowing from the north. Once within the enclosure surrounding the church, where some shelter might have been expected, the wind seemed to become stronger and significantly colder. Cruggleton Church is an unsettling place. More relief accompanied our turning our backs on it and returning across the field to the road, in a wind that suddenly seemed less strong and less bitingly cold.